By far the most amazing part of this trip has been the people we have come across. Only a couple of weeks have gone by, and honestly I don’t know if we would have been able to cover so much ground if it weren’t for these people. Since day one, there has been someone there at the right time and at the right place. Between experiencing our first lock, dropping our first anchor, running aground time and time again, there have been people to help and to give advice in every situation. Every single boater has been in a sticky situation, or in the exact same situation you are currently in and is happy to lend a helping hand. At one point, we had to cross over a dam where the current on the Ohio river was so strong, even if we were full throttle, we would have been going backwards. Bob & Madeline on a trawler with a much larger engine waited for us to catch up, threw us a line and towed us through this current. With both of our engines full throttle, we just barely cleared this dam. 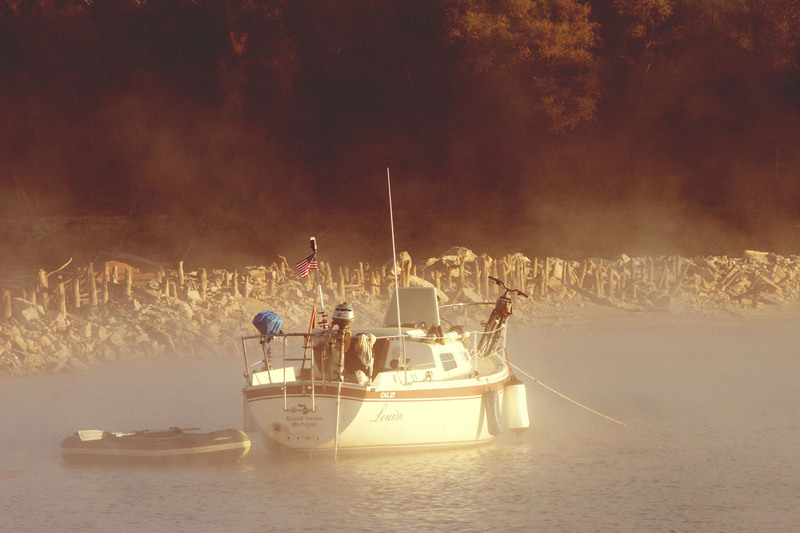 Thanks to another sailboat who had experienced this earlier in the day and relayed the info to Bob & Madeline, suggesting we would need a tow.This is just one example of people helping people. We have both been amazed at how wonderful the boating community is, and look forward to being able to help others in return. All of our friends! 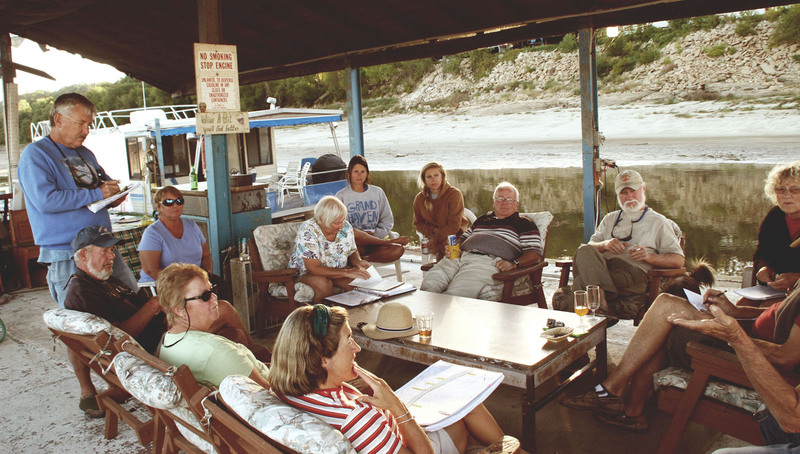 This is the famous “Hoppies” marina where all the “loopers” gathered around for strict instructions from the owner, Fern. Fern discussed with us what to plan for the next couple days on the Mississippi, and Ohio rivers. I don’t know if she purposely tried to freak everyone out, but the info she fed us was more negative than positive. We discussed anchoring and barge traffic on the Mississippi, what to do, and what not to do. Tucked behind a “wingdam” anchored out for a night on the Mississippi River. When you anchor on the Mississippi, it is extremely important you find a place out of the channel and completely out of the way of barge traffic. There are hundreds of wingdams on the Mississippi, which control the flow and current of the river. If you pull up directly downriver of these dams, it is typically deep and calm enough to stay put for a night. The 3rd night anchored out on the Mississippi, we took Reggie into shore and when we stepped out, sank to our knees in mud. We now know what real Mississippi mud is. We got our mud bath in for the day, and Katie probably spent an hour cleaning up the aftermath when we got back to Louise. The highlight of our Ohio river experience was anchoring literally in the middle of the river. The Ohio river is enormous and has an extremely strong current! We were not expecting this when we turned off of the Mississippi. After Bob & Madeline towed us through that crazy dam that I mentioned above, we began to run out of daylight and had no other option but to find a spot to drop the hook. Once both boats had anchors set, we rafted up for the night. After a very long, hot and sweaty day we bathed in the river off of our ladder without letting go. The current was so strong if we had let go of the ladder we would have been swept away! Not even our dinghy with an outboard motor would have been strong enough to retrieve anything.